What is used to make the dials and hands of watches glow in the dark? The problem of telling the time in the dark dates back to very early days in the civilized world. The invention of mechanical clocks equipped with repeater mechanisms, which chimed the hours and quarter-hours on demand, brought a partial solution. Residents of those communities rich enough to afford a belfry and clock were able to know the hour during the night with reasonable precision provided that they paid attention to the number of bells chimed. In other villages and hamlets, people generally had no choice but to use a sundial during the daylight hours and a graduated candle at night, although the precision of the latter, a fairly costly system, was not very good (see Figure 1). 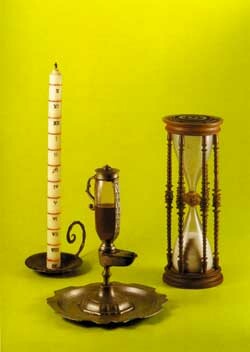 In the 19th Century, the household clock became an indispensable object, accessible to a greater number of people. Placed in an alcove, often in the bedroom, the Neuch�tel pendulum clocks were equipped with mech-anisms that repeated the hours and quarter-hours upon request. In this manner, it was possible to know the time to the nearest few minutes even if you could not see the face of the clock. Before long, these timekeepers were reduced to the dimensions of a pocket watch and remained very much in vogue until the use of the wristwatch became widespread in the early 1920s. Light is a form of energy. In order to create it, we must supply another form of energy. The two most common ways for light to occur are incandescence and luminescence. Incandescence is hot light, resulting from heat energy. The sun and other stars in the universe shine because of incandescence. When you send electricity into the filament of an ordinary light bulb, it glows white hot filling the room with incandescent light. Luminescence, on the other hand, is cold light from other sources of energy occurring at normal and lower temperatures. In this phenomenon, an energy source causes an electron of an atom to jump out of its lowest energy (ground) state into a higher energy (excited) state. However, the electron prefers its ground state and when it falls back into this position, it gives up energy in the form of light. There are several types of luminescence, each named for the source of energy that causes it. One very well known variety is bioluminescence. The most common examples are glow-worms and fireflies, which use a chemical reaction to create their light. We can get a similar effect in the laboratory by mixing together the appropriate compounds, but when the chemical interaction ceases, the luminescence stops. Living organisms have the ability to constantly renew the el-ements that cause bioluminescence. Obviously, we cannot do this for the hands and dials of a watch. Therefore we need to look at two other processes for lighting up the darkness: photoluminescence and radioluminescence. In photoluminescence, the energy is supplied by electromagnetic radiation, such as light. A photoluminescent material absorbs light for a significant period of time and then generally gives off light of a frequency lower than that of the absorbed light. This phenomenon was known already in the 10th Century when Japanese painters used lacquers prepared from photoluminescent oyster shells. One story tells of an artist who painted a landscape scene depicting a bull that magically appeared in darkness but disappeared during daylight. The animal was painted using a varnish that was the same colour as the background, but made from a lacquer composed of ground oyster shells. The first synthetic luminescent material appeared in Italy in the 17th Century, under the names of Stone of Bologna and Sponge of Light. It was composed of the compound barium sulfide. By the end of the 19th Century, Swiss watchmakers began treating the dials of timepieces with a natural luminescent paint created using the same technique as the early Japanese artists. The main drawback in using photo-luminescent material in watches is that the luminescence diminishes rapidly and totally disappears after a few hours. This effect is called decay and still exists today, although to a lesser degree, in material used as a substitute for the more effective radioluminescent substances. Radioluminescence is produced by nuclear radiation. Gamma and X-rays or alpha and beta particles are used to excite the electrons in a radioluminesc-ent compound such as zinc sulfide. This type of radioluminescent material has been used in watches since before 1920 and up until a few years ago. The dials kept their light emitting properties for a long time because they were painted with a mixture of zinc sulfide and the radiation source. 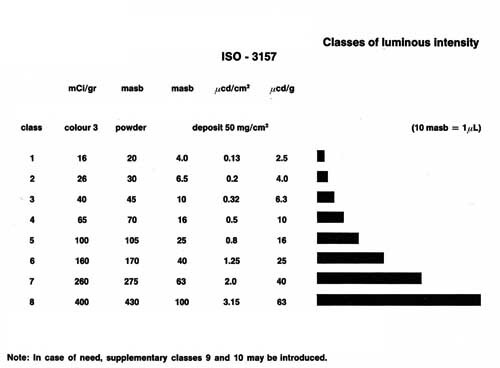 In many cases, the radioactive source was a small quantity of thorium, promethium-147 or radium-226. The French chemist, Marie Curie (1867-1934), discovered radium, at the expense of her own health. At that time, no one was aware of the dangers of handling even small quantities of this fascinating new material. Because of her research, she developed eczema and later died of leukaemia, most likely caused from the exposure to this radioactive substance. For many years, these elements were not considered dangerous to health or to the environment. With the exception of a few nuclear physicists, the general population was unaware of the dangers of radioactivity until the bombs exploded over Nagasaki and Hiroshima during World War II. In fact, even as late as 1945, radioactivity was considered to be beneficial. To cite just one example, in Germany in 1936, a rehabilitation clinic was built inside a former salt mine saturated with the radioactive gas radon. Today, people living in radon-rich areas have to use special pumps to remove this toxic gas from the basements of their homes. Even after WWII as people began to understand more about radioactivitys harmful effects, they could still buy alarm clocks with radium-painted dials that would make a Geiger counter go crazy. There was also the example of a watch salesman who tried carrying a valise full of chronographs and watches with luminous dials through an airport security checkpoint in New York. The high levels of radioactivity given off caused the alarms to sound and the bewildered soul was arrested, handcuffed and led away. While he was not charged with any wrongdoing, this incident did a lot to discredit the use of radioluminescent material in watches. The next substance used to produce luminous watch dials and hands was tritium, a radioactive isotope of hydrogen with an atomic mass of about 3. In the case of this element, the radioactivity is composed entirely of beta par-ticles that are nearly completely absorbed by the watch crystal or glass covering the dial. The tritium used in watches today is in compliance with the international Standards ISO 3157 and NIHS 97-10, which define the acceptable minimum levels for the amount of luminescence required to see the watch dial in the dark. Depending on the quality of the radioluminescent compound, it can conserve its ability to luminescence for several years. 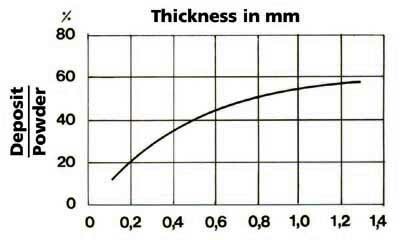 The quality also influences the luminous intensity (see Figure 2), which also depends on the surface and thickness of the deposit (see Figure 3). The pigments of the natural yellow tint yield the best results. Even though the radioactivity of tritium is much weaker than the isotopes discussed earlier, the handling of this product still requires special precautions. All workbenches must be equipped with a vacuum hood to remove any harmful vapours and small particles. Because they are mixed with the tritium, the radioluminescent materials are also considered as radioactive sources during their application onto the watch and must be handled with care. Once inside the watch and under the glass, the radioluminescent materials pose no health threat for the wearers. However, in the mind of the public, certain doubts persist, causing some people to hesitate about the purchase of this type of timepiece. The fear of potential buyers, as well as the requirements that manufacturers furnish a certificate of safety for products exported to the United States, has led Swiss watchmakers to re-examine the use of photoluminescent material, which is exempt from the rules for radioactive substances. photoluminescent material is brighter, but that it decays at an exponential rate, crossing the tritium curves at 40 and 120 minutes after activation in the two cases cited. 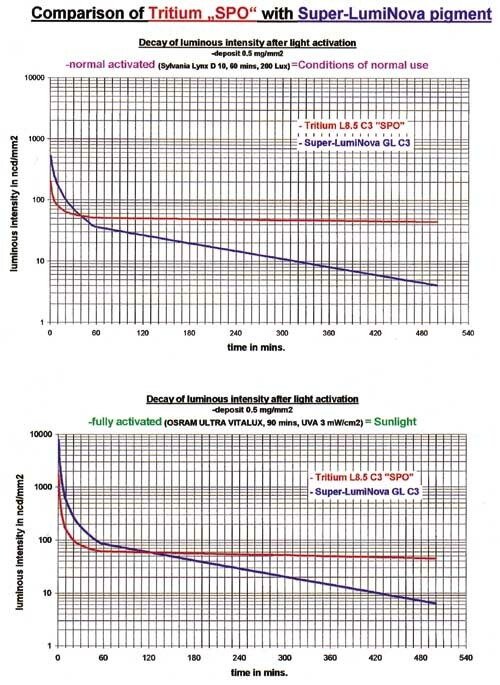 It continues to decrease rapidly and after a period of 3 to 6 hours, the luminous intensity is very low (see Figure 4). Another major disadvantage of this new compound is the necessity to recharge it by exposing it to sunlight or a powerful lamp. If the watch is worn under the sleeve, it will not get the required amount of light exposure and will not recharge itself satisfac-torily. At the current time, production of this material in Switzerland is carried out under a licensing agreement. The goal of the Swiss manufacturer, however, is to create a new and better material that is not covered by patents and that would be superior to tritium. A Swiss association for watchmaking research, the ASRH, has funded a pro-ject carried out by the University of Lausanne and the Polytechnical Institute, the EPFL, to research ways of improving photoluminescence in watches. In the meantime, the radioluminesc-ence produced by tritium is still the best solution to making watches visible in the dark. Studies have shown that wearers need not fear the levels of radioactivity given off by their luminous timepieces. An article in the British medical journal, The Lancet (Volume 343, No. 8889 January 8, 1994), compares the annual dose of radioactive radiation absorbed through the skin of the wearer of a luminous dial plastic watch with the total annual dose received from all sources. The radiation dose is expressed in units called microsieverts. This measures the effective dose, taking into account the type of radiation and the particular part of the body being irradiated.